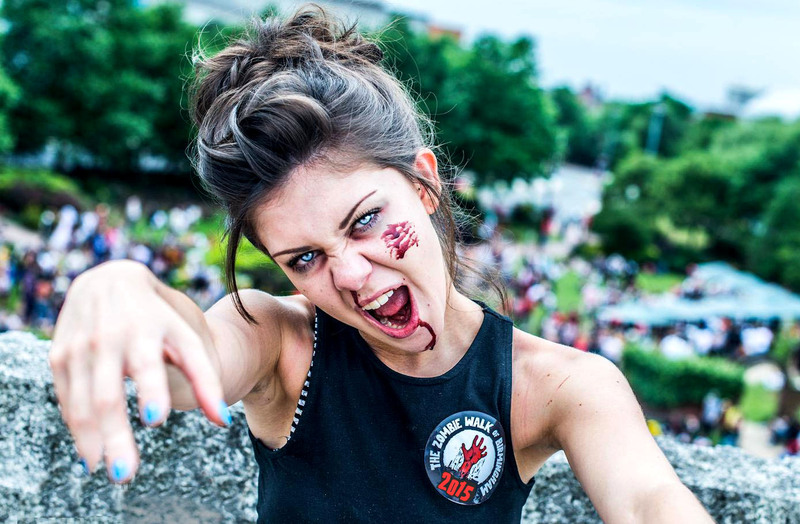 Over two thousand ‘walking dead’ are expected to take to the city’s streets to raise money for Birmingham Children’s Hospital for the city’s seventh annual Zombie Walk (Saturday 8th August*). The crowd will gather at Centenary Square before weaving in and out of the backstreets of Birmingham making eerie groans and showing off their best zombie slow walks. In 2014 over 1,200 zombies ‘rose from the dead’ to raise £11,900 to support children and young people treated at the hospital. Make-up artists will also be on-hand on the day, equipped with morbid make-up and litres of fake blood, to ensure participants are looking as ghoulish as possible. Three different make-up packages are available and need to be pre-booked via the website, starting from an additional £5 per person. Tickets cost £5 per person and can be purchased in advance at www.birminghamzombies.com. *Please note that the walk has been scheduled from June due to road works! This entry was posted in Birmingham, Fund Raising and tagged Birmingham Children’s Hospital, Centenary Square, Zombie Walk Birmingham. Bookmark the permalink.